What a potty mouth. Does he kiss his mother with that mouth? “Mulligans” to conservatives are like wormholes to physicists. They make the math much easier; and in the case of conservatives, it allows them to worm into a whole new universe of denial. True, but I am just using their terminology to effect the contradiction or hypocrisy. Questions: What institution is his four-year undergraduate degree from? What year did he graduate? He has a degree in Pizza Pie Makin. What more do you need? Perhaps we are just witnessing a political hiring spoils-system? It would be interesting to see if they will pay a director 6 figures a year without a college degree (or even an associates degree). Crown Royal? Don’t know yet if he can lead an IT shop, but he sure knows good whiskey. Solid. what kind of whiskey would jesus drink? There is lot to be admired about the work environment and business culture at Weisser Distributing. But the Director of Operations of a warehouse operation bragging on social media about consuming liquor at work ? There isn’t a Loss Prevention Department in any insurance company, anywhere that would see that as an acceptable behavior. What? No drinking at work Guy from Guernsey? Blasphemous. The WD beverage cart is one of our perks at Weisser Distributing usually saved for hitting a new milestone, or celebrating a big win. Our perks don’t stop there. We also offer VTO (Volunteer Time Off). This time can be used to serve on a non-profit board, join your kids on a field trip, or volunteer as part of a team for a service project like habitat for humanity. If you are full or part time employee, you accrue paid time off. You do not have to put a dime into your 401k, but we believe so strongly in planning for your future, we put 3% of your salary into it for you. Every Monday we have food catered in from a variety of local restaurants. Every other Thursday we cater in Buffalo Wild Wings. Every quarter we get together as a staff (and guest) for an off site party or event. We have followed the lead of many tech giants (Yelp, Twitter, Trello, and Zillow) with these kinds of benefit’s and we are not yet satisfied. A culture committee made up of employees from each of our departments has the mandate to keep employee turnover as low as possible. 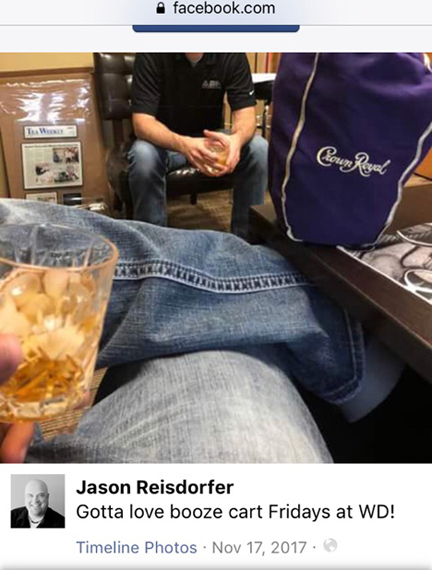 Eric Weisser: “The WD beverage cart is one of our perks at Weisser Distributing usually saved for hitting a new milestone, or celebrating a big win.” That’s a nice bit of damage control, but not how your loose lipped loudmouth partner characterizes your wholesome little ‘cart’. BOOZE, not simply ‘beverage’ (implying Kool Aid & Cokes) . . . and “FridayS” (plural, as in a frequent if not weekly event), not “…usually SAVED for hitting a new milestone or celebrating a big win.” This kind of “Mad Men”-era management ritual may be fine for your 2000s-era paint & pliers warehouse, but immature and uncultured sensibilities like that have no place in modern day municipal management. Touting that is “…a social media ‘don’t’ because it can come back to haunt you” if you aspire to gigs beyond your current position. The two snapshots on this post you provided are probably the most telling of this new administration. Sad. Believe me. This I can tell you. Thank you Mr Weisser for stopping by the comment section of the blog to register a noble attempt to make lemonade (an employee recruitment pitch) from a lemon (employee of your warehouse distribution business bragging about consuming liquor at the workplace on company time). For the benefit of OSHA inspectors, as well as Loss Prevention Specialists and Claims Adjusters for insurance companies (not to mention attorneys for prospective future plaintiffs in workplace litigation), please confirm that liquor is part of The Beverage Cart available to employees (availability limited, of course, to those days/times endorsed by management). Simply want to give you full opportunity to have your Hultgren Moment in documenting workplace practices to social media.